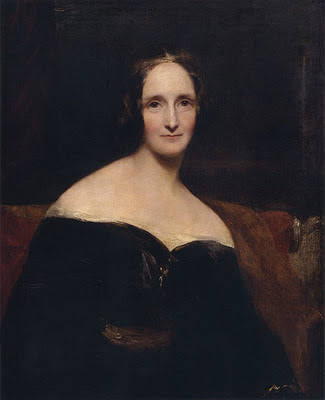 Mary Shelley was the only daughter of the writers William Godwin and Mary Wollstonecraft. She eloped with the poet Percy Bysshe Shelley in 1814, and they were married two years later. It was during this time that they stayedvfor a few days at the Vila Diodati on Lake Geneva. It was here that they and friends Byron and Polidori decided to devise stories to entertain themselves. It was the two lesser-known literary figures which produced the most memorable work. 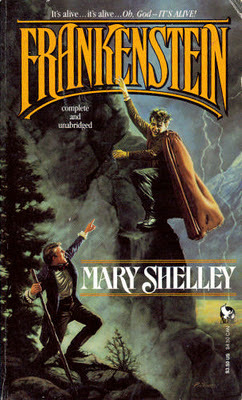 Polidori's Vampyre was relatively successful in its day, but the story of Frankenstein has burned brightly in the popular imagination ever since its publication in 1818. The story is told by an English explorer in the Arctic who assists Frankenstein on the final leg of his chase at the end of the novel. 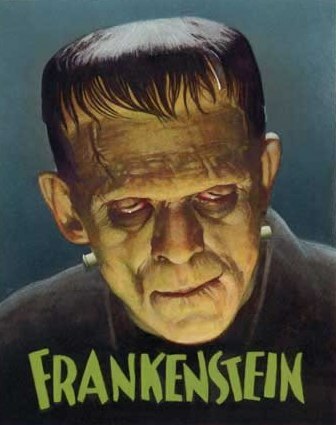 Frankenstein is a talented young medical student who strikes upon the secret of endowing life to the dead. He becomes obsessed with the idea that he might make a man. The resulting creature is lonely, miserable and an outcast who seeks murderous revenge for his condition. The creature flees with Frankenstein in pursuit. It is here that he meets the explorer and recounts his story, dying soon after. The novel has been filmed numerous times, but none has effectively conveyed the stark horror and philosophical acuity of the novel. Mary Wollstonecraft Godwin (Mary Shelley) was born on 30 August 1797 in London, England, the second daughter of Mary Wollstonecraft (1759-1797), feminist and author of A Vindication of the Rights of Women (1792) and William Godwin (1756-1836) father of philosophical anarchism and author of An Inquiry Concerning Political Justice (1793). Mary’s mother died soon after her birth and she and her half sister Fanny gained a stepsister, Claire, when her father remarried Mary Jane Clairmont. Claire and Mary would remain very close for the rest of their lives. There were bitter times for Mary growing up with a cruel step mother and emotionally distant father; she consoled herself at her mother’s graveside and spent periods of time in Scotland with friends of the family. She was educated at home by tutors were she studied her parent’s writings and literature and poetry, as well as learning Latin, French, and Italian. She also read the works of the Enlightenment literary figures her unorthodox parents associated with including the poets William Blake, Samuel Taylor Coleridge, and Charles Lamb. Mary met her future husband Percy Bysshe Shelley (1792-1822) around the age of sixteen when he became acquainted with her atheist father and his philosophy, which he soon adopted. He spent much time at the Godwin’s household discussing politics and events of the day. Percy was unhappily married to Harriet Westbrook (1795-1816) at the time, and despite Mary’s father forbidding her to see him anymore, he and Mary eloped to France in 1814 with Claire in tow for a six week tour of Europe. Mary’s father’s free love philosophy did not extend to her and they were estranged until she married. Living in London with Claire and Percy, Mary and Percy’s daughter Clara was born in February of 1815 though she died a few weeks later. Soon after, William was born (1816-1819) and the trio set out again, traveling through France, Germany, and Switzerland. They spent part of the extraordinary ‘year without a summer’ of 1816 at Lake Geneva, where Lord George Gordon Byron also summered and had a scandalous affair with Claire. They had a daughter, Allegra Byron (1817-1822). Mary and Percy Shelley married in 30 December 1816 at St. Mildred’s church in London. They jointly wrote about their travels in History of Six Weeks Tour (1817). Advocates of vegetarianism and issues of social reform, the Shelley’s were matched on many levels intellectually though Mary did not embrace the idea of an open marriage or ‘true love’ ideals Percy longed for and expressed in so many of his poems. She had started writing Frankenstein in 1816 while in Switzerland, inspired by their many sailing trips on the lake and nights telling each other ghost stories. A second daughter named Clara was born in 1817 but she died a year later. Now that they were married and Mary was on speaking terms with her father, she and Percy moved back to Italy, staying for a time in various cities including Milan, Pisa, and Venice. Much of their travels in Italy surrounded the issues between Byron and Claire and their daughter Allegra. While living in Florence Percy Florence was born in 1819 (d.1889) the same year William died. After Frankenstein, Mathilda (1819), Prosperpine and Midas (1820) followed. In 1822, Shelley suffered a miscarriage which almost took her life. The same year, as was one of his favorite past times, Percy was sailing on his schooner ‘Don Juan’ with friend Edward Williams when a sudden storm blew up and it sank. Percy’s body washed ashore and as were his wishes, he was cremated on the beach near Viareggio. Mary soon devoted her energies to the massive undertaking of compiling his poetry and writing extensive notes for them included in The Complete Poetical Works of Percy Bysshe (1824). Devastated by her loss, in 1823 Mary returned to England with her son Percy. Percy Bysshe’s father Sir Timothy Shelley provided his grandson Percy an annual income whilst he attended school before he inherited the estate and title in 1844 when Sir Timothy died. Mary continued work on her own novels including Valperga (1823) and wrote numerous short stories, essays, poems, and reviews that appeared in various journals and magazines including London Magazine and Westminster Review. Her second most popular novel, The Last Man was published in 1826. Other works to follow include; Perkin Warbeck (1830), Ledore (1835), Falkner (1837), and Rambles in Germany and Italy (1844). Possibly brought on by the strain of her prolific writing career or various travels, by the early 1840’s Shelley often suffered bouts of illness that would plague her for her remaining years. Mary Wollstonecraft Shelley died at home in London at the age of fifty-four on 1 February 1851. She lies buried in St. Peter’s churchyard in Bournemouth, Dorset, England.